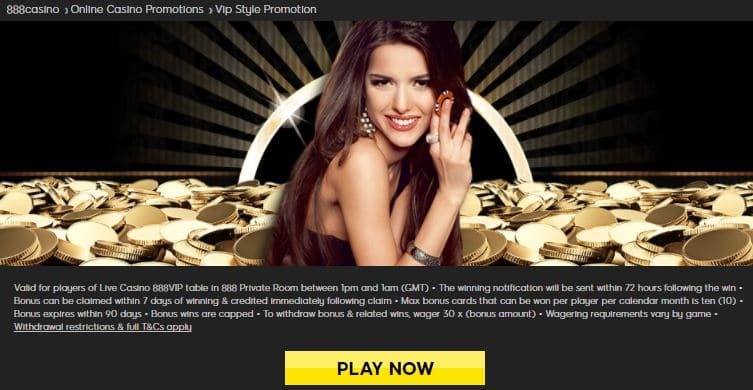 Get the taste of an exclusive life with an amazing promotion from 888casino! Play on Blackjack Live Casino and you have the chance to win up to 1.200 Pounds in bonuses. Take a seat at the Blackjack VIP table, everyday between 13:00-01:00 (GMT) and you have the chance to win some big prizes. Card decks contain 12 bonus cards, 4 of 150 Pounds, 4 of 100 Pounds, and 4 of 50 Pounds each. Draw the lucky cards and be rewarded with extra cash to gamble with! After you won, you will receive a notification and you have 7 days to claim your bonus via that notification. Hurry up and take advantage of the free money! Use your bonus within 90 days, otherwise it will expire. Wager your winnings 30 times before you can make any withdrawals. Enjoy Blackjack Live Casino and you have the chance to win up to 1.200 Pounds. Have an unforgettable gambling experience at 888casino!